Interior fire damage. Photo courtesy of Fire District 7. 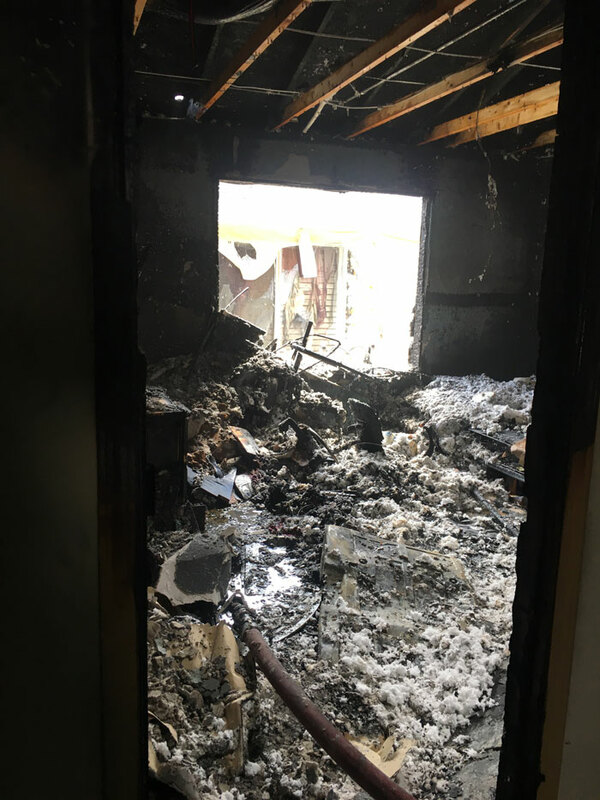 Fire District 7’s quick fire attack saved additional homes from being damaged by a quickly spreading house fire south of Mill Creek on Wednesday afternoon, May 9th. The fire was reported at 12:56 pm at a two-story house in the 19000 block of 13th Avenue SE. One person was in the home at the time the fire started. The individual tried to extinguish the flames, but the fire grew rapidly. The individual was able to get out of the home with the family’s four dogs before firefighters arrived. Crews arrived to find heavy smoke and flames coming from the windows on two opposite sides of the home. Firefighters were able to access the home and extinguish the flames that were spreading quickly. Due to their aggressive fire attack, firefighters were able to prevent the fire from spreading to the neighboring house. There was damage to the exterior of the neighboring home, but no fire extension to the structure. Firefighters from Fire District 7, Bothell Fire, and South County Fire responded. The individual who was home at the time of the fire was evaluated by paramedics and was taken to the hospital by a family member for further evaluation. There were no injuries to the dogs or firefighters. Snohomish County Fire Marshal is investigating the cause of the fire and amount of damage. Exterior fire damage. Photo courtesy of Fire District 7.